1: Law 483 Rucksack stock new never used with one 1913 rail and 3 swing swivel attachments. Stock is new I just recieved it from a trade I did in November of last year. When the guy I traded with shipped it to me he did not wrap it to protect it so it recieved some rub marks from the other USGI stock that was placed in the same box. It is painted Olive Green and can either touched up or repainted. Was told it was it was a pretty expensive stock around the $600 range but cannot confirm because there are no prices listed on 483law.com. I'm going to ask $430.00 for the stock shipped. 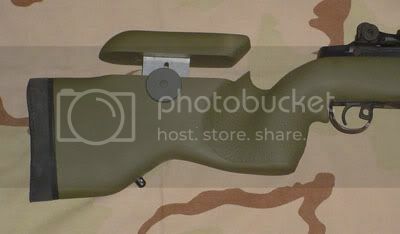 2: USGI Stock painted olive green in excellent condition. Asking $50.00 for it shipped. Opinions are like a$$holes and we do not want to hear yours!! <IMG SRC=/images/smilies/anim_naughty.gif border=0 align=middle>. It's not on my website as I am not taking new orders at this time due to my backlog (6 months +).